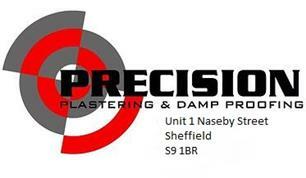 Precision Plastering & Damp Proofing Ltd - Builder, Damp Proofer based in Naseby Street, South Yorkshire. Precision is a local damp proofing business that has been established in Sheffield over a number of years. We undertake all damp control work in both the domestic and commercial sectors. Our extensive experience means that whatever your requirements, we can find a cost effective and long lasting solution to your damp problems. Our team, who are approved tradesmen, are dedicated to providing the highest standard of workmanship as well as outstanding customer service. We guarantee all of our work for ten years and are happy to provide you with free quotes.